A week of planning, a last rescheduling and finally the day was here when we bid an unofficial goodbye to the 2014 batch of Shailesh J. Mehta School of Management, IIT Bombay. 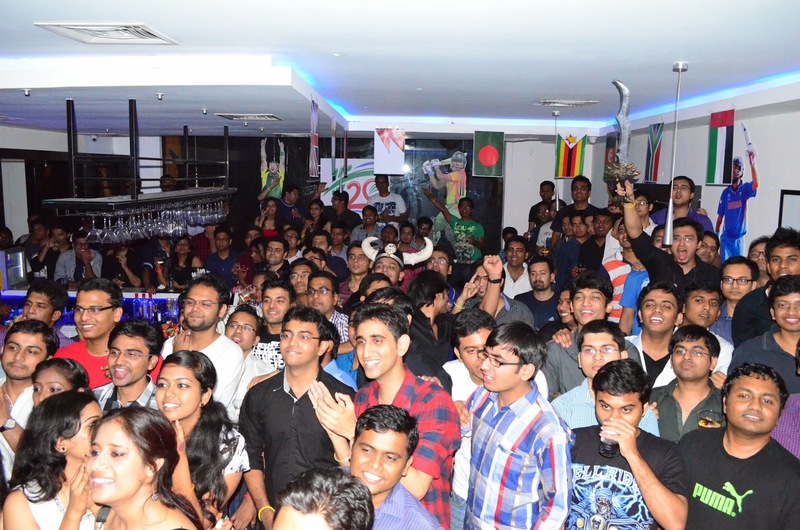 Unofficial coz this was a party thrown by the SoM'15 batch to SoM'14 and you know what I mean when I say “party” right? ;-) So the location was finalized, theme decided, invitations sent out and unlimited drinks ensured! It was 30th March 2014, a day before Navratri began, so that the “religious” guys too could get themselves soaked into alcohol once before the “dry” rituals began. Zitar in Hiranandani was the venue finalized. Although small and a little congested, it was the best a batch of 80 could afford for a 120 strong senior batch. And yeah the proximity to campus and the lovely ambience won us over at first look. The time was 7 in the evening but although punctuality is drilled into us MBA students, this was one deadline we were definitely not gonna meet. To add to the delay was a World Cup T20 match between India and Australia. So people started to trickle into the venue at around 8 and went straight to the Television. And it was only after India had ensured a comfortable victory and we had celebrated our love for our team, that the party finally began! And How!!! Then came the tradition of doing a paper dance… Kinda difficult tradition to follow given the gender ratio at SJMSoM… But nevertheless, some lucky guys did get a chance to dance with the lovely ladies. This was supposed to be followed by some other games for some selected seniors but then by now, not many were in a state to play games. This is when my role switch happened to a gate keeper. Keeping the guys who had no sense of themselves in another area away from the others who just wanted to have a nice time. Gets necessary to avoid any untoward incident. We are after all representing SJMSoM, IIT Bombay and carry the institute’s tag along with us. Every party has a moment where it all quietens down a bit. People who want to eat, form a cartel at the buffet corner. Some just wanna go take a walk outside and grab some fresh air. Or some other kindda air may be… ;-) While others just wanna sit and do nothing. And this was time for one such moment in our party. Would you call it a lull or just the silence before the storm? I guess the latter is more apt. Because, what followed was truly a storm! We managed to get the games started and that was when the energy levels went through the roof! It was time we invited some of the popular seniors on stage and asked them to perform tasks. Simple, known, tried and tested tasks but yet very effective and highly entertaining. Old is gold they said, well said! So after the proposals and the dances and some other small tasks, it was time to unleash the last bit of the DJ on the crowd to help let them loose. Well, totally loose and beyond control. Would that be all that bad? I would personally think otherwise. After all it’s the end of a journey for them, a 2 year long, difficult, hectic, fruitful and fulfilling journey! The dancing was on at full swing for a long-long time. This was the time the seniors forgot all the good and bad that they have seen so far, and just dance! Dance with all the energy, dance with passion, dance with joy, dance with their batch mates and we, juniors join them in their celebratory dance! It was time to let it all go! Just when your body cannot take it anymore but your mind does not want to stop, comes a voice from the manager of the place, “ladies and gentlemen, this is the last song of the night”. That’s when you realize that its 1:30 in the night, the last night you will get together as a batch. After your body has given all its energy, that “once more” starts to ring in your head. And that is when people like me had to take up the role of a bouncer. Just to ensure that everyone vacates the place with dignity and the manager is left behind happy and content. Go for the link of Misti Polanski and see the best piece of the writing in this area. You can also see the beta policy and get the proper pattern here. Get the link of cheap essay writing services and enjoy the copy editing and the other service here.